For each of the past several years, the Des Plaines River Canoe and Kayak Marathon has identified an accessory tax exempt 501(c)(3) organization with related interest in paddlesport and/or the preservation and recreational potential of the Des Plaines River. Marathon registrants have been encouraged to supplement their $22 registration fee with an additional $3 (or more) to benefit the designated organization. Included have been the Upper Des Plaines River Ecological Partnership, the Radio Amateur Civil Emergency Services of Lake County, Openlands, the IPC Paddlers’ Patrol and Water TrailKeepers Programs, and Prairie Rivers Network. Each organization has thereby received a several hundred dollar contribution from Marathon participants. Inspired this year by Bob Faber’s presentation at the 2015 IPC Annual Banquet/Meeting of the Chicago Voyagers (CV) Organization, the Marathon has identified CV as the 2016 target of these donations. Chicago Voyagers uses the outdoors as a tool to quickly and effectively impact inner city, at-risk youth. Engaging youth in activities such as canoeing (lake, river, wilderness and whitewater), camping, and environmental stewardship teaches them the importance of teamwork, of acting responsibly, and of communicating respectfully. It is hoped that such life lessons will empower the youth to stay in school, avoid unhealthy behaviors, and create a better future for themselves. Moreover, the Voyagers are being encouraged to participate in the foreshortened, 5.25 mile Minithon option of the 2016 Marathon. To learn more about the organization, please take a moment to review their website for further insight at www.chicagovoyagers.org. Naturally, the Voyagers would welcome the volunteer assistance of individuals or paddling clubs in the enactment of their programs! Enjoy nature, learn new skills, and fundraise at the same time! August 20-27 is the Chicago Voyagers (CV) Boundary Waters Fund Raising Trip. Last year, CV raised over $12,000 for at-risk youth to enjoy the outdoors. Please consider participating this year! If the 18.5 miles of the Des Plaines Marathon (May 22 this year) are not long enough for you – participate in one of these events to test your stamina – or at least, be astonished that some paddlers can do this. Starting in Wonch Park, Okemos, MI and ending in Grand Haven on the edge of Lake Michigan. Campus to Coast (C2C160) is a paddle sport adventure race put on by the Michigan State University Outdoors Club. The race starts on MSU’s campus at the Rock (central part of campus), following the Red Cedar River into the Grand River and out through Grand Haven, finishing at Grand Haven State Park. The race is approximately 160 miles, with estimations of the fastest times being anywhere from 26-40 hours, depending on the river conditions, and 57 hours being the cut-off time. This race also contains 7 portages, along with one section where racers must “canoe line” a small section of fall over dams. This race can only be competed in using kayaks, canoes, or a vessel that is strictly “man powered.” Participants are from all over the U.S., as well as other BIG 10 Universities. Described as the “Race to the Midnight Sun,” this 444-mile wilderness adventure paddling race is held on the Yukon River, from Whitehorse to Dawson City, in Canada’s Yukon Territory. Held during the last week of June, the YRQ is the world’s longest annual canoe and kayak race. Paddlers race round-the-clock under a sky that never gets dark. There are just two mandatory rest stops – totaling 10 hours – over the course of the entire event. The Yukon River Quest draws participants from all over the world. In 2015, 57 teams from 12 countries started the race and 44 teams finished. This is a non-stop canoe race that starts at night with a thrilling running-start to the river in Grayling, MI, and ends 120 miles later near the shores of Lake Huron in Oscoda, MI. Contestants must navigate the narrow, winding upper stretch in total darkness, as well as stump-filled ponds and the blazing July sun in the lower stretch. This race is not a recreational canoe float, but a professional, ultra-competitive race with the very best professional paddlers from around North and Central America. Before planning to participate, check the website for more details – this is not for beginners. Check each website for more information, pictures, and if you know of any other North American long distance paddling races, let us know and we’ll add them to the list. Experienced paddlers, bring your canoe or kayak and celebrate the legacy of canoe legend Ralph Frese by paddling down the Chicago River from Willow Road Dam to Linne Woods in Morton Grove. A shuttle bus will be provided and will run from 8 am to 2 pm from Linne Woods (Dempster St and Ferris Ave) to Willow Road Dam. The event is free and concludes with a celebration at Linne Woods where refreshments will be served. For more information call 312-533-5751. More picnics are spoiled by weather reports than by the weather, wrote Don Mueggenborg (who has paddled every event but one since its starting) after last year’s event. Forecasts had everyone concerned – rain, high winds, lightning. Instead we had a great day. Overcast early with a slight mist and headwinds to cool the paddlers down. More than seven hundred paddlers participated in 2015, including 37 in the shorter Minithon, with several SUPs finishing the whole course. Most paddlers came from Illinois, Indiana, Iowa, Michigan, Minnesota, Ohio and Wisconsin, but also from as far as Arizona, Florida, Nebraska and Texas. Everyone who finished the course received the coveted embroidered patch. New in 2015 was also the inclusion of the Des Plaines River map on the back of the t- shirts that brought many congratulatory comments, and will be on this year’s t-shirts as well. 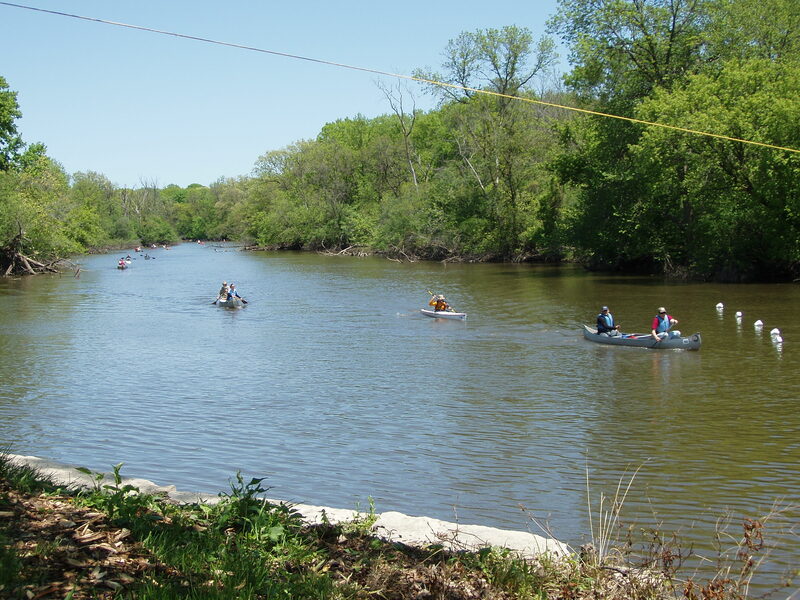 The Des Plaines River Canoe and Kayak Marathon, founded in 1958 by Ralph Frese, is the second oldest continually held paddling competition in the United States. The course is 18½ miles on the beautiful and historic Des Plaines River in Northern Illinois. Numerous classes accommodate people of all ages, crafts, and skill levels, and a 5.25 mile, non-competitive Minithon offers a shorter option. First time participants, repeat paddlers, and serious competitors can all enjoy the excitement, challenge, and wonderful scenery that this historic event provides. Great music, good food, and camaraderie await everyone at the finish line. Saturday, May 14, 10 a.m.–4 p.m.
McHenry County Conservation District will be hosting its 8th annual Paddle in the Park. Please help spread the word, or volunteer to help us with the event. Test the waters, dip a paddle in the crystal clear waters of Lake Atwood, and discover the joy of canoeing, kayaking, and stand up paddle boarding at Paddle in the Park: Saturday, May 14, from 10 a.m.–4 p.m. at The Hollows Conservation Area, 3804 US Highway 14 in Cary. Hosted by McHenry County Conservation District, this event is a great opportunity for beginners to get introduced to the sport, or for experienced paddlers to pick up information on local outings and outfitters. “McHenry County residents have access to many nearby waterways, and our hope is that we can get individuals and families to take their next outdoor adventure on the water,” said Communications Manager Wendy Kummerer. Local vendors will be on hand to discuss the different types of watercrafts available and which type might best suit you or your family’s needs. A number of canoeing resources will be available, such as information on where to paddle, where to get lessons, clubs to join, local outfitters and rentals, and details on local river trips and Midwest excursions. We will also feature music by award-winning singer/songwriter/canoe enthusiast, Jerry Vandiver. Jerry has song credits on over 15 million records and two of his titles are hanging in the Country Music Hall of Fame. There will also be food for sale by MJ’s Coffee Bar. Participants this year will include the American Canoe Association, the US Coast Guard Auxiliary; local canoe and kayak clubs such as Prairie State Canoeists, Illinois Paddling Council, and Southwest Brigade; plus retailers, including L.L. Bean and Erehwon Mountain Outfitters. Registration is not required. For more information, call Prairieview Education Center, (815) 479-5779 or visit www.MCCDistrict.org. We are also seeking volunteers to assist as safety paddlers, or to assist with instructional clinics. If you would like to volunteer, please contact Andy Talley at (815) 479-5779 ext 14. Although it’s focused on winter paddling in the warmer end of the state (i.e., Southern Illinois), the images evoked and tips provided are applicable state-wide. Though you might want to check out Paul Klonowski’s article on cold weather paddling in this TIP before heading out.